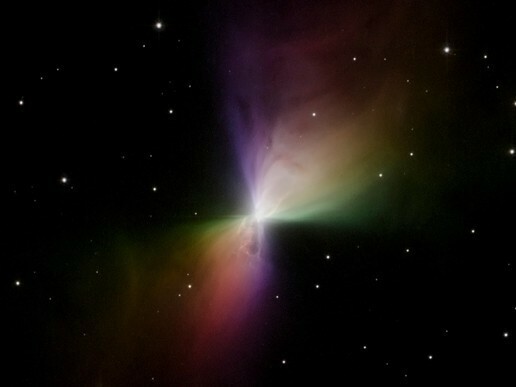 The Boomerang Nebula is the coldest natural location in the universe. It has a temperature of 1 K, or just one degree above absolute zero. This is particularly interesting because the cosmic microwave background is about 3 K. That makes the nebula colder than empty space. But how is it possible for this nebula to be colder than the universe? It turns out this nebula is transitioning from a red giant to a planetary nebula. A planetary nebula doesn’t have anything to do with planets, but rather is a gaseous nebula caused by a dying red giant. The term was first coined by William Herschel in the 1700s because he thought they looked like planetary systems starting to form, and the name stuck despite our improved understanding. A planetary nebula forms when a sun-like star begins to run out of hydrogen to fuse for energy. The star begins fusing helium, which creates energy at a greater rate causing it to swell into a red giant. After its core can no longer fuse helium the star enters what is known as the asymptotic giant branch. While it can’t fuse hydrogen or helium in a continuous fashion, it is able to fuse them in bursts. This is similar to a gas engine running out of fuel, where it throttles up, dies down and throttles up again. These bursts of energy create tremendous stellar winds, which causes outer layers of gas to flow out from the star a high speed. In the case of the Boomerang Nebula, the outward flow is at about 160 km/s. As gas expands it gets colder. You may have experienced this if you’ve used an aerosol can and felt the can get cold as you spray. In the same way, the outward flow of gas in the Boomerang Nebula causes the temperature to drop, which is how it can be colder than deep space. 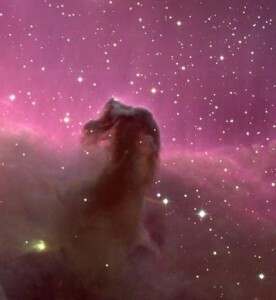 Such a low temperature is a product of the nebula’s dynamic evolution. Recently in the Astrophysical Journal new observations of the nebula were presented. We’ve known about the nebula’s cold temperature for a while, and we’ve had good images of the nebula in the visible spectrum, such as the Hubble image above, but these new observations from the ALMA radio telescope array give us a high resolution radio image. One of the interesting things the ALMA team found was that the nebula isn’t quite the shape seen in visible images. Many planetary nebula have a dual-lobed shape as seen in the visual images, but the Boomerang Nebula appears to have a more spherical shape. The reason the nebula appears lobed is because there is a thick dust region around the equatorial region of the star, which blocks light from the central star. As a result, only the polar regions are strongly illuminated from the central star, hence the lobed appearance. While the Boomerang Nebula is currently the coldest known region in space, it won’t stay that cold forever. Already the outer envelope is starting to warm a bit due to its exposure to the (relatively) warmer surrounding space. The so called “black holes” are said (by numerous “authorities” on the subject) to be considerably “colder” than 1K… In which sense of the word “natural” are “black holes” NOT natural? For example, our Milky Way galaxy center is reported (Wikipedia: goo.gl/iypifh) to host a “supermassive black hole” (≈ 4,100,000 solar masses (≈ 8.2×10^36 kg)). According to various authorities, such a “black hole” would have a “temperature” of from ≈ 1.2×10^-10 K (Hawking: goo.gl/QywGeq), to 1.5×10^-14 K (Frolov & Novikov: goo.gl/eJVqnS), to 4.9×10^-39 K (Davis et al: goo.gl/cU9Frl), that is, from 10 to 40 orders of magnitude (ouch!) “colder” than 1 K… such temperatures are precariously close to 0 K! It is worth noting that one of the four “scientific formulae” that (according to Wikipedia (goo.gl/h4aO8R)) yields the temperature 1.5×10^-14 K — ( ћ·c^3/(8π·G·M·kB )) — has been lauded as “one of the most beautiful relations in theoretical physics since it contains all [ALL? (HN)] the fundamental constants” (goo.gl/eJVqnS) and “One of the most beautiful and profound formulas in physics in the last fifty years” (goo.gl/hQJI3C). With the above in mind, AND assuming that Hawking et al are not TOO mistaken in their hypotheses, AND assuming that “black holes” too are “cold embers remains from dying stars” — what IS the “coldest known region in space”?